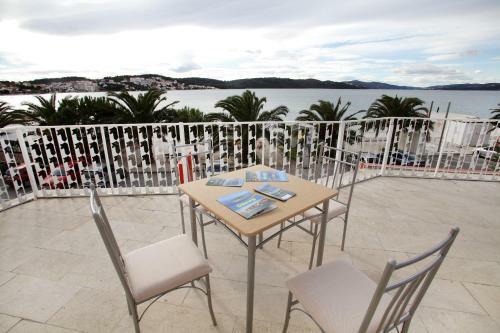 Apartments Balote provides self-catering accommodation situated on the waterfront in Okrug Gornji. Gratis wireless internet access is available throughout and you can sit back on the balcony or outdoors terrace of your accommodation. Some apartments presents sea views, but there is a shared terrace providing sea views and a spacious dining area. A kitchenette is provided in each accommodation to prepare your dishes, and there is a supermarket in the same building. 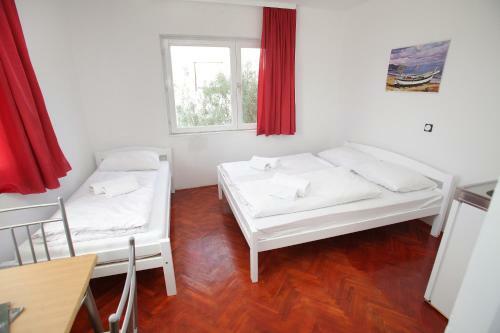 Studio Smokvica ~0,2 km, Okrug Gornji Just 150 metres from the beach with several clubs and eating places and 2. All studios comprise a furnished outdoors terrace, well-equipped kitchen with dining area, sofa seating and a flat-screen satellite television. The private restrooms come with a shower and a washing machine. At Studio Smokvica you will find a back yard with olive trees, a shared terrace and grill amenities. Within a 150 metres reach, you can find boat lines that go every 15 minutes to the historic core of Trogir. 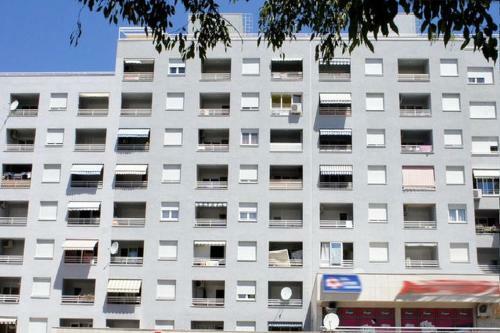 Trogir ( ~ 1.6 km ): 563+ accommodation units. Seget Donji ( ~ 2.9 km ): 108+ apartments, 94+ villas, 2+ hotels. Vrsine ( ~ 9.6 km ): 8+ villas/holiday houses. Beach Mavarstica, Okrug Gornji ~ 1,2 km from Apartments Balote Sandy beach: ideal for families, recommended for young people. Beach Okrug Gornji, Ciovo ~ 1,7 km from Apartments Balote Sandy beach: ideal for families, recommended for young people, with restaurant, with caffe bar, equipped with showers. Excellent choice of watersports. Beach Pantan, Trogir ~ 2 km from Apartments Balote Sandy beach: ideal for families, with caffe bar, equipped with showers. Beach Medena, Seget Donji ~ 3,8 km from Apartments Balote Gravel beach: ideal for families, recommended for young people, with restaurant, with caffe bar. Excellent choice of watersports. Beach Kava, Slatine ~ 9,2 km from Apartments Balote Gravel beach: ideal for families, with restaurant, with caffe bar. Restaurant Sv Dominik, Trogir Guest reviews: 9,2/10 ~ 2,3 km from Apartments Balote Address: Blazenog Augustina Kazotica 1, 21220, Trogir. Cuisine: Croatian cuisine. Restaurant Mediteraneo, Trogir Guest reviews: 8,5/10 ~ 1,3 km from Apartments Balote Address: Ulica Kralja Tomislava 70, Trogir. Cuisine: Croatian cuisine. Restaurant Kristian Pizza, Trogir Guest reviews: 9,1/10 ~ 2,3 km from Apartments Balote Address: Bl. Augustina Kazotica 6a, Trogir. Cuisine: Pizza. 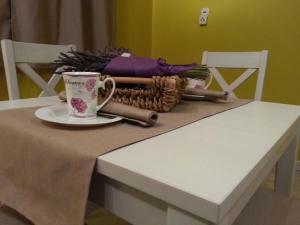 Restaurant Piccolo Ponte, Trogir Guest reviews: 10/10 ~ 2,1 km from Apartments Balote Address: Vukovarska 9, 21220, Trogir. Cuisine: Pizza & Pasta, Grill. Restaurant Kamerlengo, Trogir Guest reviews: 7,6/10 ~ 2,2 km from Apartments Balote Address: Vukovarska 2, 21220, Trogir. Prices: 6 HRK - 6 HRK. Cuisine: Croatian cuisine.